Habit: Perennial herb, glabrous, glaucous or not; sap colorless. Leaf: basal, deeply dissected, segments often lobed. Inflorescence: raceme, panicle, or 1-flowered. Flower: biradial, nodding to erect; sepals 2, shed after flower; petals 4, white or cream to pale yellow to pink or pink-tipped, persistent or not, outer 2 free, lanceolate, alike, both pouched at base, inner 2 adherent at tips, oblanceolate, +- crested on back; stamens 6, +- fused in 2 sets opposite outer petals; ovary cylindric to long-conic, placentas 2, style 1, stigma lobes 2. Fruit: oblong, fusiform to ovate, or conic, dehiscent from tip. Seed: few, 1--2 mm, oblong to reniform, smooth to finely netted, black; fleshy appendage present. Species In Genus: 18 species: North America, Asia; some ornamental. Etymology: (Greek: twice spurred, from outer petals) Note: Other species in TJM (1993) moved to Ehrendorferia (Liden et al. 1997 Plant Syst Evol 206:411--420). Habit: Plant 20--45 cm, rhizomed. Leaf: 2-ternate-dissected, 20--50 cm. Inflorescence: 2--30-flowered. Flower: nodding; outer petals 14--19 mm, rose-purple to cream or pale yellow, not drying black; base of central stamen of each set aligned with lateral 2. Fruit: 14--20 mm, oblong. Ecology: Damp, shaded areas; Elevation: < 2400 m. Bioregional Distribution: NW, CaR, SNH, n CW; Distribution Outside California: to British Columbia. Flowering Time: Mar--Jul Note: Further study needed to determine if small plants from northwestern KR (leaves blue-glaucous adaxially; petals cream to pale yellow with rose tips), described as Dicentra formosa subsp. oregana (Eastw.) Munz, Oregon bleeding heart, deserve taxonomic recognition. 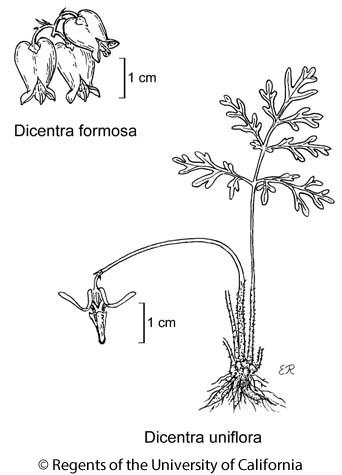 Citation for this treatment: Gary L. Hannan 2012, Dicentra formosa, in Jepson Flora Project (eds.) Jepson eFlora, http://ucjeps.berkeley.edu/eflora/eflora_display.php?tid=22766, accessed on April 20, 2019. NW, CaR, SNH, n CW; Markers link to CCH specimen records. Yellow markers indicate records that may provide evidence for eFlora range revision or may have georeferencing or identification issues. Purple markers indicate specimens collected from a garden, greenhouse, or other non-wild location.